Mia had her debut cheerleading performance last week at her school’s Fall Festival. Being that I was always more of a sporty girl, it was interesting when she told me she wanted to do Spirit Squad this year. I am so glad she decided to, as she has had so much fun with her friends. She’s also learned some super fun cheers that I may or may not like to cheer right along with her. How cute are the Pom Poms by the way? I love me some SPIRIT!!! After Mia’s performance on the cafeteria stage, Sophie ran up to her and gave her a big congratulatory hug. Me with my big girl cheerleader. I thought it would be fun to snap a few pictures of the girls outside as the sun was setting. I adore sun drenched blonde pigtails, don’t you? Let the sun flare fun begin. Sophie ready to attempt the monkey bars, in a cute modelish way. I just love her poses…. The over the shoulder serious glance. Such a classic. 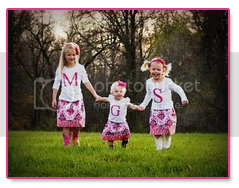 I asked these three crazy girls to give me some poses on the blacktop since I had a fun sun flare opportunity. My husband was complaining of the “glare” while I kept snapping away. Hip popping poses when Gracie’s eyes close. Sun flare, I love you. And I will love you even more when I get a real camera. Can your girls come pose for me?! My boys literally yell "NO CAMERA" when I pull out the camera. Cuties! I just found your blog. Very cute. I have 1 girl, who is 3.
i have been watching the project 320 blog, we have a large mops group here @ our church in upstate new york, how can we help?! Oh my goodness. Love the poses. Classic. G. O.! Mia! okay, I was a sporty girl too - there will be no toe touches here but in my heart I was cheering her on! Love the "sun flare" pics - Sophie really can pose - gorgeous girls.